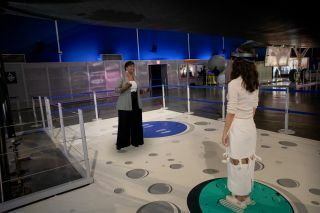 You can see a hologram of NASA astronaut Mae Jemison at the Intrepid Sea, Air & Space Museum in New York. NEW YORK — Visitors at the Intrepid Sea, Air & Space Museum on the Hudson River here can now come face to face with a hologram of Mae Jemison, the first African-American woman in space. Located beneath the space shuttle Enterprise, the new "mixed-reality" experience uses Microsoft HoloLens headsets to lead visitors on a journey through the history of trailblazing women at NASA — and a holographic tour of the inside of the space shuttle — with Jemison as as a tour guide. A hologram shows NASA astronaut Peggy Whitson taking a spacewalk outside the space shuttle Enterprise. While the exhibit focuses on women in space — hence the title, "Defying Gravity: Women in Space" — you won't find only a bunch of holographic women hanging out underneath the Enterprise. Through the HoloLens headset, you can also explore the inside of a space shuttle, watch an astronaut take a spacewalk and peek inside the window of a Project Mercury space capsule. Using a HoloLens headset, you can see the inside the space shuttle Enterprise at the Intrepid Sea, Air & Space Museum in New York. "Defying Gravity: Women in Space" opens to the public today (Sept. 22) during the seventh annual Space & Science Festival. The exhibit's grand opening coincides with Smithsonian magazine's Museum Day, when museums and other cultural institutions across the U.S. will grant free admission to anyone who downloads a free ticket. You can get free tickets to the Intrepid Museum here.